I've been blogging for almost 2 years now and I like to think I've got the hang of it! But there's certain things that only a blogger would understand. 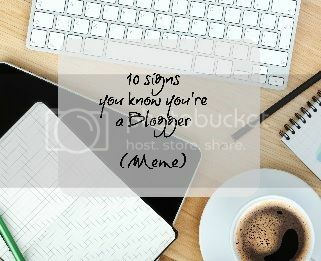 Clare at Emmy's Mummy has started up a new linky and she has invited fellow bloggers to link up their "10 Signs you know you're a blogger" posts. 1. No parcel can ever be unwrapped without photos being taken first. Elliot knows that he's not allowed to play with certain things until I've taken photos and he even says now "Mummy do you need to take a photo first?!" "Waaaaait! Mummy needs to take a photo!!!!! " 2. You have notebooks full of blog ideas and to-do lists...to-do lists that are never completed! 4. Your blog social media takes over your personal one - once upon a time I had my own Twitter account but it has been severely neglected and pushed to one side so I can concentrate on my blogging account. Nowadays the people I follow are fellow bloggers, brands I admire/work with and the occasional friend! 5. You pretend not to be concerned about the stats and tell yourself that you blog for yourself and that's all that matters. But when the Tots100 scores get updated you can't help but feel disappointed with the chart placing! 6. You have a pile of random bits that has been sent to you, it either needs reviewing or needs to be found a home. Currently I have a pile of things in my spare room, random things like an anti-snoring ring and collection of kids toys! 7. Your friends and family know all your news before you tell them because they read it on the blog! 8. Everything is potential blogging material - potty training? Let's write a post! Been out for the day? Lets review it! Eaten something yummy? Instagram it! 9. You get genuinely excited when you get an email in your blogging inbox, who knows what opportunity it could be! 10. Your evenings are spent ignoring your partner while you tap away on your laptop. I don't know how other bloggers manage to blog in the daytime with children around, I don't get a moments peace until 7pm!! hahaha! I love this. It is so, so true! Laughing and nodding in agreement to all of these - especially heading something you've already written about, sad but very true.